The C-82 Packet was a twin-engine, twin-boom cargo aircraft designed and built by Fairchild Aircraft. It was used briefly by the United States Army Air Forces and United States Navy following World War II. Problems surfaced almost immediately as the aircraft was found to be underpowered and its airframe inadequate for the heavy lifting it was designed to perform. As a result the Air Force turned to Fairchild for a solution to the C-82's shortcomings. A redesign was quickly performed under the designation XC-82B, which would overcome all of the C-82A's initial problems. 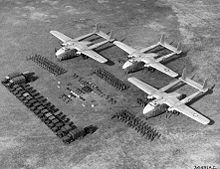 First flown in 1947, the XC-82B would go into production as the C-119B Flying Boxcar. In the end only 223 C-82A would be built, a very small number for a production cargo aircraft of that era. Most were used for cargo and troop transport, although a few were used for paratroop operations or towing military gliders. During its brief operational life several C-82 Packets were utilized during the Berlin Airlift, primarily bringing large disassembled vehicles into the city. In 1946 the US Postal Service explored the concept of flying post offices using highly modified C-82s which would operate similar to those on trains where mail would be sorted by clerks and put in bags and then transferred to trucks on landing. 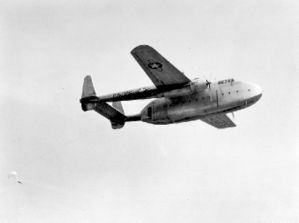 Though itself unsuccessful, the C-82A is best considered as an early development stage of the C-119B Flying Boxcar. The C-82A saw limited production before replaced by the Flying Boxcar. 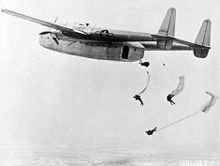 A total of 53 C-82As were procured by the United States Navy, though they too were quickly replaced by the Navy version of the C-119B Flying Boxcar. Brazilian Air Force - the Primeiro Grupo de Transporte de Tropa (1st Troop Transport Group) operated C-82s until 1969. The last flyable C-82A had been owned and operated by Hawkins & Powers Aviation, an aerial firefighting company located in Greybull, Wyoming. This plane was purchased at auction by the Hagerstown Aviation Museum in Hagerstown, Maryland. The aircraft was flown to the Hagerstown Regional Airport on October 15, 2006. This marks the last flight of a C-82. The aircraft will remain on display at the HRA until a dedicated space for it is made available in a future museum building to be built near the original Fairchild Manufacturing Facility. Two incomplete C-82As remain at the Greybull site. One of them (civil registration N5102B) was also recently obtained by the Hagerstown Aviation Museum, and is currently waiting to be transported to the museum where it will be used in a "Building the Boxcar" exhibit. The fate of the other incomplete C-82A (civil registration N8009E) is uncertain. One C-82 operated by the Brazilian Air Force rests outside the Museu Aeroespacial in Rio de Janeiro city, waiting for restoration at the museum's shop. C-82A serial number 48-0581 is at the National Museum of the United States Air Force near Dayton, Ohio. This aircraft is currently undergoing an extensive restoration of its fabric control surfaces and has been moved near the Museum's restoration facility. C-82A serial number 44-22991 is in the Walter Soplata Collection in Newbury, Ohio. The aircraft is incomplete and stored outside. C-82A civil registration PP-CEL is located in Manaus, Brazil. The aircraft is in poor condition. C-82A civil registration 2202 is stored at Campos dos Afonsos, Rio de Janeiro, Brazil. It is an ex Brazilian Air Force aircraft. C-82A civil registration HK-426 is located at Bogota El Dorado Airport in Bogotx�, Colombia. The aircraft is incomplete and in very poor condition. The C-82 is perhaps best known for its role in the 1964 novel, The Flight of the Phoenix, and Robert Aldrich's original 1965 film version. Based on the novel by Elleston Trevor, the story centers around a C-82 that crashes in a desert, is rebuilt using one tail boom, and flown to safety. Three Fairchild C-82s (one flying and two derelict) were based at Long Beach Airport in California during the filming. They were operated by Steward-Davis Inc. The flying aircraft was N6887C while the two derelicts were N4833V and N53228. The other aircraft used was an R4Q-1 Navy Packet BuNo.126580. Swanborough, F.G. and Peter M. Bowers. United States Military Aircraft since 1909. London: Putnam, First edition, 1963.